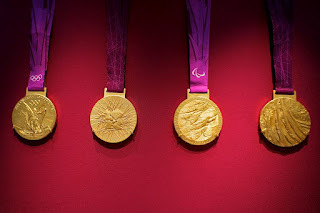 2012 Olympic medals. Used with permission from Wikimedia Commons. The Olympics are probably blowing up your social media feeds right now. This Olympics is expected to topple previous social media records for sporting events. And there will be drama. For example, a tweet has already cost one Olympian her spot on the team. 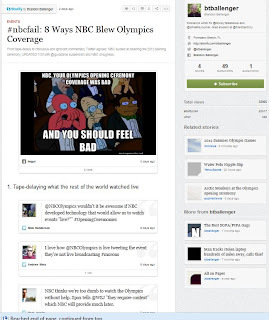 If you're an avid Twitter user, you may have seen tweets with the hash tag #nbcfail, referring to the less-than-stellar Olympics coverage of NBC. Their much-criticized coverage has included inane (and at times offensive) commentary, inadvertent spoilers, a delayed broadcast, and the cutting of an on-air tribute for victims of the July 7, 2005 London bombings. A British journalist who complained about the coverage and tweeted an NBC executive's email address to his followers had his Twitter account temporarily suspended. This is a screenshot of a Storify on NBC's Olympic coverage. Other drama? Well, for one thing, the gold medal victory of U.S. gymnast Gabby Douglas was tarnished slightly by social media users who took to various formats to complain about, of all things, her hair. And in slightly stranger news, various tributes to the exuberance of Samuel L. Jackson's Olympic tweets have also surfaced online. If you're a researcher, keep in mind that social media and the Olympics will be ripe for study this summer. Right now, you might be collecting tweets for analysis of any number of topics connected to the sporting event. Four years ago, Hutchins and Mikosza looked at social media during the Beijing Games. Their article "The Web 2.0 Olympics: Athlete Blogging,Social Networking and Policy Contradictions at the 2008 Beijing Games"* is a good read. The authors highlight contradictions in the 2008 blogging guidelines like athletes being encouraged to express themselves but limiting marketing messages and avoiding comments on political systems. During the 2008 Games, one media manager attempted to write a sample blog post for his athletes, to demonstrate writing within the guidelines. According to Hutchins and Mikosza, he found it “rather difficult” to follow the contradictory rules in the social media policy. The article is also a nice recap of the social media issues during the games that you may have forgotten by now, like the photos of track cyclist Mike Friedman wearing an anti-pollution mask and the defense of his choice on his personal blog and swimmer Stephanie Rice’s party dress pictures on her Facebook page that were published in media outlets. Hutchins and Mikosza said controlling Twitter would be the next difficult challenge for the Olympic committee in future games. What do you think? Check out the blogging policy for the London Games. http://www.olympic.org/Documents/Games_London_2012/IOC_Social_Media_Blogging_and_Internet_Guidelines-London.pdf. Let’s say you are an Olympic athlete in London today. Would you be able to write a blog that meets these policies? Let us know how it goes! *This article is not available for free online, but you should be able to access it through a public or university library. Here is the citation: Hutchins, B. B., & Mikosza, J. J. (2010). The Web 2.0 Olympics: Athlete Blogging, Social Networking and Policy Contradictions at the 2008 Beijing Games. Convergence -London-, 16(3), 279-297.